Victas V > 15 Extra – New dynamic spin, plastic ball ready, fast high tension rubber for the advanced player. 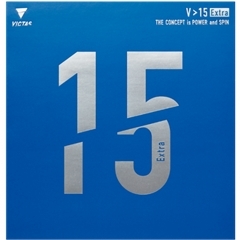 Victas V > 15 Extra – Dynamic spin, fast high tension rubber for the advanced player. Victas V > 15 Extra is the ultimate weapon for aggressive offensive players! V > 15 Extra is a high-end offensive rubber which will enable 0ne to perform on a new level in topspin rallies. Feel the ultimate power and high-efficiency energy conversion of the innovative 47.5° offensive sponge and experience the unlimited potential of the spin-optimized top rubber sheet! Demanding offensive players who rely on aggressive topspins as well as topspin-to-topspin rallies will take their play to a new level with V > 15 Extra! The Victas German-Japanese team of designers (GJ Tec) have developed an outstanding series of professional table tennis rubber called V for maximum power and balance. The rubber sheets in this family are V > 01 (Medium Sponge), V >01 Limber (Medium Soft Sponge) and now the latest edition the V >01 Stiff (Medium Sponge with Tackier Top Sheet), and V > 15 Extra (Medium Hard Sponge Sheet) and V >15 Limber (Medium Soft) Sponge Top Sheet. The Victas V > 15 topsheet has a moderately tacky surface and a more direct pimple alignment. The result is a highly responsive rubber sheet that produces great spin, and speed on contact. The rubber is also very responsive for over the table touch shots. This rubber is ideal positioned to help produce the maximum spin with power. It is suitable for close to the table and mid distance play and has a throw angle of 47 degrees. The “Power & Balance” concept was optimized such that the slightly softer sponge design of V >01 enables higher ball trajectories, which significantly increases forgiveness in less-than-perfect topspin strokes. In attacking strokes, the rubber provides for fantastic feel for speed plus inimitable speed glue effect. High Energy Tension Technology gives topspin players of all levels the opportunity of utilizing their own offensive arsenal to the fullest. Victas Brand: Victas is a premium brand launched in 2001 by the Mr. Koji Matsushita, TSP president and former world class defensive player. Victas strives to produce premium product for both the defensive and offensive player by combining Japanese Know-How with German expertize. VICTAS stands for: Innovation - Quality - Passion. “Our mission is to develop products that will make, every player better. If you are looking for a revolutionary brand with second-to-none commitment and passion for innovation. VICTAS will be the right choice. In order to meet our high product quality standards, our team of VICTAS experts in Japan and Europe is ready to face the challenge every single day. We live and work by the, motto “Nothing but the very best will do”. Your shopping cart is currently empty. Please add any product to the shopping cart by browsing our catalog, selecting a product and clicking the ADD TO CART button.